Help Chabad of Wyoming Help Others! Chabad of Wyoming serves the entire community, the affiliated and non-affiliated, young and old and all in between. Chabad reaches out to all who are in need and assists them with their financial and emotional needs as well as serving the community at large by offering programs and classes for all ages. From toddlers to seniors, all have a place and feel welcome at Chabad. Chabad is committed to strengthening Jewish identity, unity and pride. We cannot do this alone. We count on support from people known for their benevolence, care and sensitivity to the needs of all of mankind. We are working today for a brighter Jewish tomorrow, one Mitzvah at a time and one person at a time. We need your partnership to continue strengthening Jewish life. Chabad of Wyoming is not funded by by Chabad headquarters in New York. We, as every Chabad center, are responsible to raise all funds for our operating budget. We are supported exclusively by the generous contributions of individuals and foundations that care about our community. 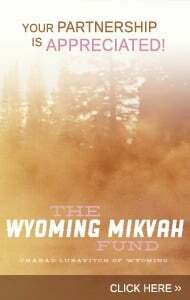 All funds raised by Chabad of Wyoming remain in Wyoming and go directly into services and programs for the local Jewish community and Jackson Hole visitors. Donate in honor of a loved one's birthday, anniversary or Yarzeit. An acknowledgment will be sent to them and your contribution is tax deductible to the fullest extent by law. You can make a difference. Please take a moment to send your tax-deductible contribution to Chabad of Wyoming. Become a Partner with a $3,600 contribution to help Chabad cover its annual budget. 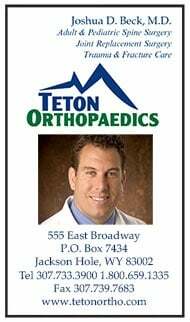 Phone – Call our office at 307-462-0847 and we will be glad to assist you. Online – Click on the "Donate" button on the top of this page to contribute. This page uses 128 bit SSL encryption to keep your personal data secure. Planned Giving - With tax rates at 55% learn how you can protect your assets for your community and family. Stock Transfer - Have your stock broker call our office at 307-462-0847 and we will give them the DTC information they need to contribute stock. Land - Your piece of real property can go a long way in helping Chabad help others. It is also a fantastic way to benefit from a tax deduction at the end of the year. Car - Donating a car will help Chabad's volunteers get around town. Free pick up available. By donating your land, property, vehicle or stock to Chabad, you will support Jewish life in Jackson Hole and benefit from a tax deduction at the same time. Please contact us at 307-462-0847 if you would like to explore other giving methods or opportunities.